Police probing an alleged plot to bring down flights have found a suitcase containing items which could be used to construct a bomb, the BBC has learned. 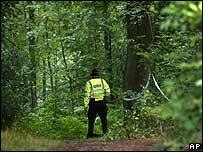 Officers have been searching a piece of land called King's Wood in High Wycombe, Buckinghamshire. A police source told the BBC the case contained "everything you would need to make an improvised device". Other officers have confirmed only that a suitcase was found. Scotland Yard has not officially commented on any finds. Some 49 residential and business premises and one area of woodland have been searched in connection with the inquiry, police say. Of that total, 36 searches have finished and 14 are ongoing, including the search at the wood. The alert began last Thursday. A district judge has granted anti-terror officers an extra seven days to question 21 of the 23 suspects being held, and an extra five days to question two. Flights are gradually returning to normal, with British Airways saying only 19 short-haul journeys out of Heathrow airport were cancelled on Thursday, and a full schedule is anticipated on Friday. BA also said all 5,000 pieces of luggage misplaced in the confusion at Heathrow would have been sent out to passengers by the end of Thursday. The 23 suspects in custody in London were arrested in raids in London, High Wycombe in Buckinghamshire, and Birmingham last week. Under the 2006 Terrorism Act the maximum period someone suspected of terrorist activity can be held without charge is 28 days, subject to regular court approval. It is believed up to 17 people are being held in Pakistan over the alleged plot - with two British nationals of Pakistani descent among them. One has been named by Pakistani officials as Rashid Rauf, but they released no details about the other Briton. Pakistani intelligence believe it was his role to plan and co-ordinate the operation on behalf of a senior al-Qaeda figure, the BBC was told.